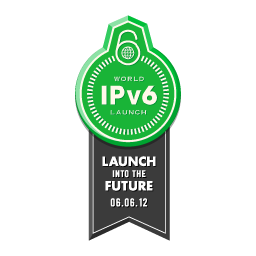 IPV6 launch day is just around the corner. Less than four days to go at the time of this posting. I couldn’t think of a reason why I should be left out of all the fun, so I took the plunge and configured my server (Bamboo) to serve up this site from both IPv4 and IPv6 addresses. My server is now IPv6 ready, but it will probably be several more years until I see such an address from my home ISP [unless I move]. Despite the coming wider adoption of IPv6, I do not foresee IPv4 disappearing very quickly. With tunneling services between the two networks, I imagine it could take as long as a decade before IPv4 use drops to a point where its deprecation is accelerated, and perhaps even longer. A few years from now I will probably be saying that I miss the days when IP addresses were easily memorizable. There are a few extra steps to getting your sites up and running after you’ve added your IPv6 address to your virtual private server. First, make sure that ifconfig correctly shows that your IPv6 address is added for Scope:Global and not just Scope:Link. Second, if you’re using UFW (Uncomplicated Firewall), then you need to enable IPv6 support in /etc/default/ufw. Then you must readd your exceptions with UFW so that it creates both iptables and ip6tables rules for you. Finally, you can configure Apache to serve up Web sites on your IPv6 address. If you’re using Ubuntu, I found the Apache configuration to be automatic with no adjustments necessary.